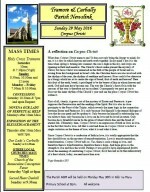 What does Corpus Christi mean to me? It does not only bring the liturgy to mind; for me, it is a day on which heaven and earth work together. In my mind’s eye it is the time when spring is turning into summer; the sun is high in the sky, and crops are ripening in field and meadow. The Church’s feasts make present the mystery of Christ, but Jesus Christ was immersed in the faith of the people of Israel and so, arising from this background in Israel’s life, the Christian feasts are also involved with the rhythm of the year, the rhythm of seedtime and harvest. How could it be otherwise in a liturgy which has at its centre the sign of bread, fruit of earth and heaven? Here this fruit of the earth, bread, is privileged to be the bearer of him in whom heaven and earth, God and man have become one. The way the Church’s feasts fit in with the seasons of the year is therefore not an accident. Consequently we must go on to discover the inner rhythm of the Church’s year and see the place Corpus Christi has within it. First of all, clearly, it grows out of the mystery of Easter and Pentecost: it pre- supposes the Resurrection and the sending of the Spirit. But it is also in close proximity to the Feast of the Trinity, which reveals the inner logic in the connection between Easter and Pentecost. It is only because God himself is the eternal dialogue of love that he can speak and be spoken to. Only because he himself is relationship can we relate to him; only because he is love can he love and be loved in return. Only because he is threefold can he be the grain of wheat which dies and the bread of eternal life. Ultimately, then, Corpus Christi is an expression of faith in God, in love, in the fact that God is love. All that is said and done on Corpus Christi is in fact a single variation on the theme of love, what it is and what it does. Since Corpus Christi is a confession of faith in love, it is totally appropriate that the day should focus on the mystery of transubstantiation. Love is transubstantiation, transformation. Corpus Christi tells us: Yes, there is such a thing as love, and therefore there is transformation, therefore there is hope. And hope gives us the strength to live and face the world. Perhaps it was good to have experienced doubts about the meaning of celebrating Corpus Christi, for it has led us to the rediscovery of a feast which, today, we need more than ever.